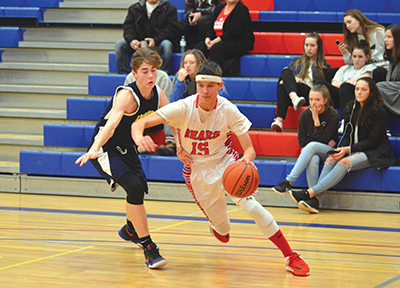 They had a good season finishing in second place in the District 4 standings but a semi-final game loss to Our Lady of Lourdes ended the ODSS Bears junior basketball team’s season on Thursday, February 15. The Bears had a 12-2 record for the season and were a dominant team in the District scoring 880 points while allowing 607 against in 14 games. After knocking out St. James 74-33 in their quarter-final match, the Bears were geared up to take on the third place team from OLOL. At the end of the first quarter the Bears were trailing 19-17. A hard fought second quarter saw the ODSS team move ahead and take a four point lead mid-way in the quarter, but the OLOL team managed to close the gap and at the half the game was tied 37-37. The third quarter got underway with a successful charge by the OLOL team that placed them seven points ahead. The teams matched basket for basket keeping the Guelph team ahead for the quarter and going into the fourth quarter. The Bears played an aggressive fourth quarter trying to close the point gap but in the end they had to take a 75-70 loss to end their season. The District 10 championship game between Our Lady of Lourdes and John F. Ross CVI got underway at the University of Guelph on Saturday, February 17. OLOL came out on top by a single point winning the championship 59-58.